The players in my campaign (Keep on the Shadowfell) recently tangled with a nasty goblin named Irontooth who had been leading a band of kobolds in raids against the town of Winterhaven. They were unable to take him down in their first encounter with him and were forced to regroup and rest up. Since they had wiped out most of his minions in their initial assault on his hideout, I wanted to make their return visit a little more interesting than finding him alone in a cave. I decided that while the PCs were licking their wounds, the few remaining kobolds would gather up their dead and perform last rites. Kobolds have a strong association with dragons, so it seemed appropriate for them to burn their dead in a funeral pyre, symbolic of the “cleansing fire” of the dragons they worshiped. In addition to being a nice way to make the world seem more realistic and alive (the PCs would return to the cave to find a smoldering pyre and kobold bones) it also let me introduce a what I hoped would be a cool and unexpected encounter. In keeping with the undead themes presented later, I envisioned the Kobold Wyrmpriest gathering the bodies and heaping them on a pyre, performing a dark ritual (perhaps influenced by the teachings of a priest of Orcus). This rite had the power to reanimate the dead to ward against intruders. The bones of the fallen would rise from the ashes, wreathed in fire, flames roiling inside their hollow eye sockets. These creatures provided a fun, unexpected encounter for the PCs who were in the middle of patting themselves on the backs for dispatching Irontooth and his minions. In the actual encounter in which they appeared, I tossed a handful of kobold minions at the PCs (a hunting party that had returned to the cave and was ordered by Irontooth to guard the entrance), surprising the players by having the skeletons rise in the second round of combat. 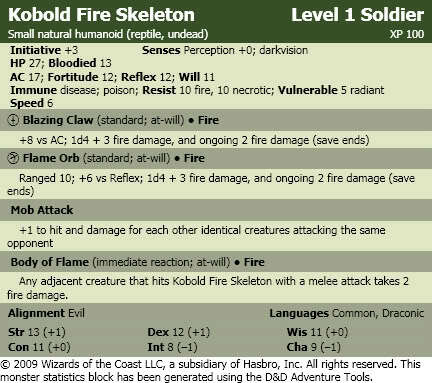 The appearance of flaming kobold skeletons that shot fire from their eye sockets elicited a couple of “whoas” and at least one “cool”, which, as a DM, is one of the more rewarding words you can hear at the table.